A detailed look at a Mac-Lander Trailer reveals the solid construction inside and out. 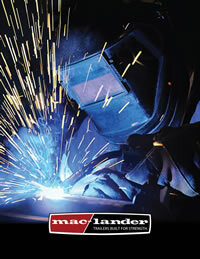 Mac-Lander Trailers incorporates the highest quality materials, workmanship, and unique features, to build the trailers that set the standard for quality. FM, FH & SL Series Flatbed Trailers are equipped with “Roughneck” diamond plated fenders. All Mac-Lander Trailers are equipped with conduit enclosed wiring loom and safety brake-away kit with battery. FH and SL Series Flatbed Trailers are equipped with heavy duty spring assist jack. DO Series flatbed trailers equipped with protected and recessed tail lights. E-Z Crank Beavertail. All tag-alongs equipped with reliable sealed beam tail lights.